Prime Minister Binyamin Netanyahu this morning, Sunday, issued a statement on the passing of US Sen. John McCain. 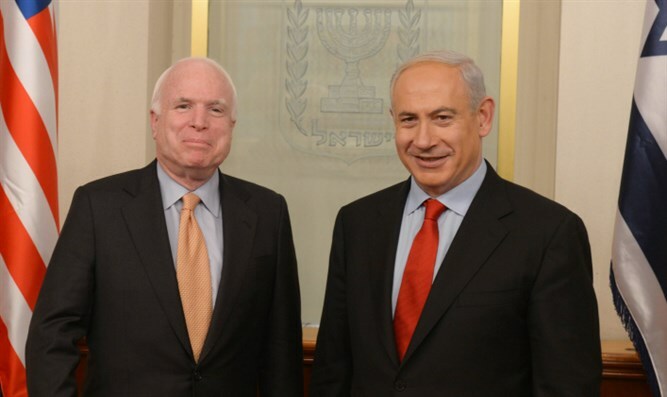 "I am deeply saddened by the passing of John McCain, a great American patriot and a true friend of Israel. I will always treasure the constant friendship he showed to the people of Israel and to me personally," Netanyahu said. "His support for Israel never wavered. It sprang from his belief in democracy and freedom. The State of Israel salutes John McCain." The prime minister's statement came as Israeli politicians across the political spectrum eulogized the former US senator. McCain's office said in a statement that the Arizona GOP senator died at 4:28 p.m., and was accompanied by his wife, Cindy McCain, and their family. "At his death, he had served the United States of America faithfully for sixty years,” McCain's office wrote. McCain’s death from brain cancer came more than a year after he announced he had the condition in July of 2017. McCain has been absent from the Senate this year due to his illness, and cast his last vote on December 7. Before he left, treatment had forced him to use a wheelchair in his final days in Washington.